Bedbugs make their home where ever you sleep and feed from you as you do. Bedbugs have become an outright epidemic for both economy and luxury lodging alike, spreading so quickly that the EPA is holding summits to address the problem. But, just like vampires of fiction, these very real blood suckers can only enter your home invited. They are less invited as much as they are carried in. If you travel a lot or a little, there is no need for panic. There are some simple steps you can take to ensure that you are not bringing any stow-aways with you. Do not pack any items that cannot be washed in water up to 120 degrees. Heat is bedbugs kryptonite! 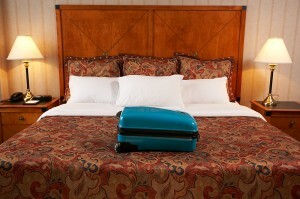 Be sure to keep your bags packed until you have a chance to inspect your room. Always pack a flashlight. Start by focusing on the bed and furnishings. Inspect under neath the corners of the mattress, the box spring, and the piping of the furniture. You are not only looking for the bedbugs themselves, but also their eggs, larvae, body casings, and feces. If it is a manageable size, you will also want to inspect behind the headboards too. If you do happen to find something, bring it up to management so they can relocate you to a different room that is not with in close-proximity to your room. While a small sign may not be reason to leave the establishment completely, should you find a large infestation you will want to stay elsewhere. The bottom line is you need to stay in a room that has never had a history of a problem. Don't put your luggage on the bed or upholstered furniture. It is better to rest your bags on the luggage rack rather than cloth furniture, or worse under the bed. It is best to carry non-cloth baggage and keep your belongings packed for the duration of your stay. You may even want to take a your prevention a step farther and seal everything in Ziploc bags. You can even put your clothing in the newer, larger bags available. Do not forget your electronic items such as a clock or shaver. At the end of a trip, before placing your bags in to your vehicle for the drive home, put them in a trash bag and tie is securely. This way, just to be safe, you will not allow bedbugs loose in your car should you have missed some. As soon as you arrive home, take anything that can be washed and launder it in hot water. Then put it through a dryer that will get it to at least 120 degrees. In case all these prevention steps still fail, you may want to invest in plastic-zippered cases for you mattresses, box springs, and pillows to prevent any bedbugs you may have missed from setting up a home there. Regardless of the material your luggage and travel bags are made of, you will want to store them outside of your home or at least your bedroom if you can. It is safer to keep them in the garage, shed, or even the laundry room.